Wanted to stay outside Florence. SO GLAD we did! What a great find. La Cipressina apartment is the exact reason we use VRBO! We found a place that looked nice based on the pictures, but exceeded our expectations in reality! Upon arrival we were greeted by Dorrit, and her daughter who were both very pleasant and offering of any information we desired. The apartment had everything we needed, and even came with a bottle of their own wine, produced from the grapes you see pictured. The beds were comfortable, everything was clean. (if you decide to stay and need to use the pull out bed, make sure to get instructions on how to open it up, it was unlike any pull out that I have used before in the US-its better). The real surprise came in the morning, when I went outside to look at the property. We had arrived after dark and couldn't really see what the countryside looked like on the way in. When I stepped outside, I was blown away, there were vineyards, and olive trees and majestic homes as far as the eye could see. What a BEAUTIFUL location!!! If you are a wine enthusiast or a biker, or just someone like me that enjoys the beauty of rolling hills filled with grape vines, and olive trees, I would HIGHLY recommend staying here. Thank you so much! Happy to read you enjoyed your stay and the countryside, even the weather was not the best and everything looks much better in spring and summer with a little more sunshine. So... if you want to come back we would be very happy, you are always welcome! We absolutely LOVED our stay at La Cipressina apartment. Dorrit and her family were so welcoming and the space is wonderful. The location made it easy to explore nearby wineries and Florence museums, but mostly we enjoyed relaxing in the pool with the incredible view! Highly recommend - we are already trying to plan our next visit! We would be lucky to see you again. I can recommend you to everyone: good communication, nice children, apartment left in perfect conditions. Thank you! Our family totally enjoyed the stay! Our family (wife and I and two children aged 12 and 13) spent one glorious week in La Cipressina apartment. It more than met our expectations. It was spacious, beautifully designed, tastefully decorated, and incredibly well appointed - it was a treat just to be spending time there. The views were fantastic and the location was perfect for visiting some of the well known and lesser known sites of Tuscany. There are some very good restaurants near by. The children also fell in love with the large pool and the table Tennis in the lovely garden. The owner, Dorrit and her famliy, could not have been more welcoming and helpful. We can't express our appreciation for her warm hospitality. We will recommend this apartment to any friends or family travelling to Italy and hope to be back again one day! We had an amazing holiday here with our two young children. Many thanks Dorrit and Vittorio! Not 5 points from 5 ,but 100 from 100!!!! "everything in this location is perfect and the view and surroundings are breathtaking.I wish another hollyday there as soon as we can." Take the motorway A1 up to its exit Firenze Sud, then follow the SP222 "Chiantigiana" direction for Greve up to km 11,4. Vittorio and Dorrit welcome you and your children in a familiary atmosphere. We produce our own olive oil and wine and will be happy to let you taste. 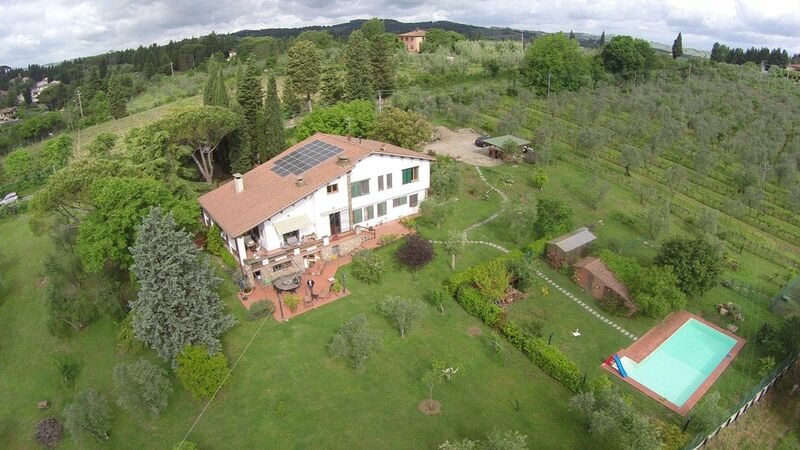 The house is in an ideal position for trips to the cities of Florence, Siena, San Gimignano, Certaldo or to the idyllic villages and picturesque landscape of Chianti.Walks on foot and by mountain bike possible. Golf course at 5 minutes.